I do not believe that GDP growth – or the pursuit of wealth in general – ought to be an end in itself. Nonetheless, the fact is that virtually all countries today do consider the production and redistribution of wealth to be a fundamental goal. 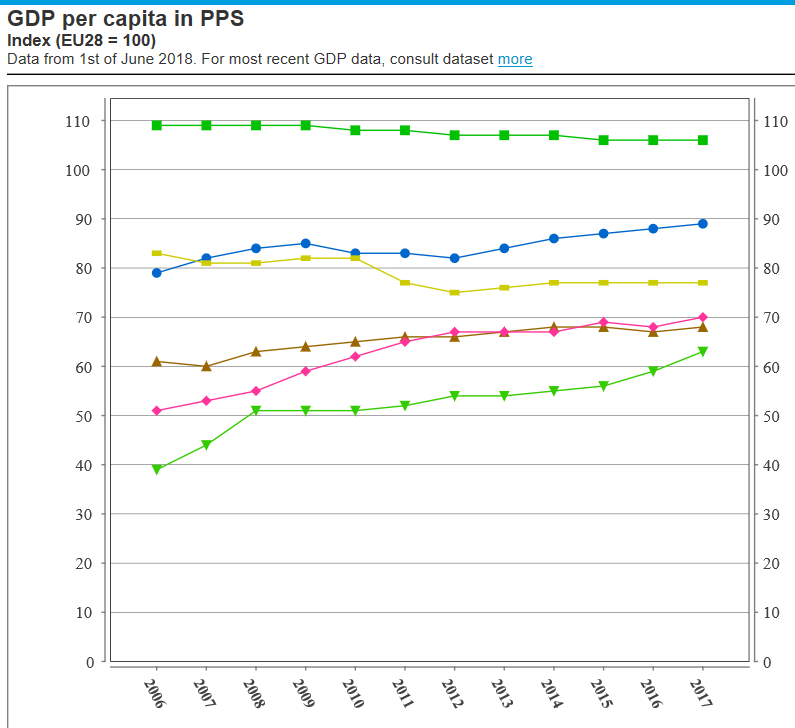 In this context, GDP per capita (minus wealth from national resources) is a decent proxy for a society’s organizational capacity, which certainly is a very relevant metric in any case. A particular concern is that heterodox and populist governments, whether leftist or nationalist, tend to be economically incompetent. This would presumably be due to populist movements’ lower human capital (intelligent, prudent, and/or conformist managers avoiding “controversial” movements) and to their emotional intensity and demagogy. One thinks of Britain’s postwar socialist economic stagnation, post-Perón Argentina’s perpetual economic mediocrity, and Venezuela’s current economic collapse. When Orban took over in 2010, Hungary was near collapse. The country was soldiering through a Greek-style debt program administered by the International Monetary Fund and the European Union. He moved decisively to clean up the country’s finances, slash the budget deficit from 5.3 percent in 2011 to 2.4 percent in 2012 (it was down to 1.9 percent last year) and pay off the debts to the EU and the IMF, cutting the share of foreign currency-denominated debt. To be able to do that, Orban nationalized Hungary’s private pension funds and raided their cash stash. He introduced a flat 15 percent income tax (which greatly improved collection) and raised value-added tax to 27 percent, the highest rate in the EU. He imposed special taxes on sectors dominated by foreign-owned companies — energy, utilities, finance, telecoms, retail and media — taxing revenue and assets, not profits, to make optimization unfeasible. And he renationalized some key firms to sell them on to Hungarian investors, often to his friends and allies. According to the latest economic forecast of the European Commission – no friend of the Orbán government – Hungary’s annual economic growth should moderate (as in the rest of Europe) from 4.3% this year to 2.6% in 2020, inflation will remain low, and already remarkably low unemployment of 3.6% will continue to fall to 3.2%. Hungary’s public debt, which peaked at 80.7% in 2011, is projected to fall to 68.6% by 2020. The country maintains healthy budget and current account surpluses. Compared to other Central European countries such as Poland and Czechia, Hungary has slightly underperformed in recent years in terms of GDP growth. Interestingly, Hungarians’ household debt has considerably declined in recent years, from over 40% of GDP in 2011 to under 20% today, while that of the Poles and Czechs has remained steady. This suggests the frugal finances of Hungarian consumers may have reduced domestic demand and thus growth. Overall, it would seem that Hungary’s economic performance is well in line with that of the rest of Central Europe, notwithstanding the usual kvetching about the Orbán government’s corruption (although I am in no position to judge whether that is worse than the region’s usual mediocre-to-awful standards). All this suggests that national-populist regimes are economically viable, notwithstanding globalist complaints. As in everything else, in “patriotic economics” there needs to be an Aristotelian happy mean. Having completely open economic borders means being vulnerable to every economic dysfunction and predatory practice in the rest of the world. Being completely closed means poverty and stagnation relative to the outside world. With the triumph of the “Washington Consensus” (not to mention what ought to be called the “Brussels Consensus”) in the 1990s, the pendulum clearly swang too heavily in favor of open borders, particularly concerning the free movement of capital. The unlimited free movement of capital means that your economy is now distorted by whatever goes through the minds of the capital-holding investors, who are by no means “rationally omniscient,” but are as prone to fashions, prejudice, and panics as the rest of us. Hence, your economy is liable to get overheated due to excess investment (which, for the investing country, also means your banking sector could now collapse because of economic problems in another country) and international capital runs. If your consumers take loans in a foreign currency, they also risk ruining themselves if the national currency’s value declines significantly, for whatever reason. In general, increased economic “interdependence” between countries means added complexity and fragility. If anything goes wrong anywhere, it means everything collapses everywhere. Simplicity and antifragility are your friends. Do you really want the global economy to be a game of Jenga? The recent historical record suggests a moderate regime of “national economics” is best. The Asian Financial Crisis in the 1990s was one example, in which countries resorting to capital controls to kill financial panics recovered most quickly. The more recent Eurozone Crisis has been very instructive in the same sense, stressing the benefit of having a national currency, representing and responsive to local socio-economic conditions, in order to guarantee financial confidence and adjust (devaluation) if necessary. National currencies and relatively autonomous national financial systems are generally good, because they allow every nation-state to develop and adjust according to its own socio-economic rhythm. Faith in a currency, meaning its value, is a reflection of confidence in a society’s collective ability to redeem that money for actual goods and services. This ability is naturally often misestimated by economic actors and currency fluctuations, ideally not too erratic, are actually a pretty good way to recognize and adjust to this. Open borders reduce national economic independence and therefore the real republican sovereignty of citizens (hence why classical republicans tended to favor economic autarky). Of course, for some the goal is to limit national sovereignty and encourage “market discipline,” which incidentally is official EU doctrine. National economics means staying closer to the real economy and it means less brutal adjustments. It means maximizing real sovereignty. It also means ensuring, to the greatest degree possible, the coinciding of self-conscious socio-economic entities with political power and responsibility. A nation is a consciousness, an emotional group identity, a national conversation. Each national economy furthermore has its own socio-economic rhythm, with its labor-capital negotiations, its social norms, its economic performance, etc. A nation-state ensures that decisions are, to the extent possible, taken within a coherent socio-economic unit, rather than having decisions imposed by foreigners one does not understand, does not feel for, and who typically face different economic conditions. Open borders means a perpetual economic mess, which can only be solved by “consensus” between governments. Therefore the usual farce of diplomatic chicanery, lowest-common-denominator “solutions,” brinksmanship, etc. All this is very inefficient and undemocratic too. In multinational states, such as Belgium and Canada, there is no shared national feeling or conversation. The “national conversation,” such as there is, is mediated by journalists and other elites, speaking for (instead of) citizens. There is a near-infinite supply of such bug-men, willing to talk down their fellow nationals, in the name of unfeeling and arbitrary “consensus.” Politics is dominated by constant negotiations and compromises between politicians from the two nations, a highly opaque process of wheeler-dealing which favors abandoning electoral promises. Multi-nations are inevitably “governed-by-committee.” Admittedly, Canada and Belgium are very functional societies, but then again they have a high level of human capital and no one has ever expected anything from them. Under pressure, these “nations” collapse: the Québécois rioted when the Anglos tried to draft them to fight Hitler in World War II and the Flemish enthusiastically collaborated with the Third Reich in the hope of securing independence from Belgium and/or a favorable position in the Germanic-dominated New Order (the latter was a realistic ambition). National economics is good for civic sovereignty, political responsibility, economic effectiveness, and national self-confidence. Generally, you ought to encourage local industry in every viable sector, according to what is possible given the local scale and human capital. Hungary cannot make its own Google (Europe could, if it had a will, which it doesn’t). Bershidsky writes that many people have left Hungary in recent years: “educated, adventurous people driven out of the country as much by a stifling sense of missing opportunity under Orban’s rule as by economic considerations.” Central Europe’s low fertility means it cannot really afford much emigration and brain-drain. However, the departure of people with left-liberal and anti-national apatride inclinations may be good for the region’s survival in the long run. Anyway, emigration from Hungary is (unfortunately) about the same as elsewhere in there region, namely a bit worse than Czechia, a bit better than Poland, and remarkably better than Portugal and Greece. Orbán’s critics claim he has brutally slashed the “education” budget in half. To which I say, if this blessed news be true: God bless Orbán! God bless the Magyars! All this is admittedly very macro, whereas things like corruption and policy competence are granular and difficult to measure. Their negative effects may only be felt in the medium term. Nonetheless, so far, Hungary’s populist government, which has been around for a while, seems very normal in these terms. Central Europe in general will continue to slowly converge with Western European standards of living. How far they converge is a very interesting question. So far, Czechia has overtaken Portugal and looks set to enjoy Western European standards of living. I would not be too surprised if Hungary and Poland do the same, although I am more pessimistic about the Balkans. In general, Central Europe has furthermore been converging with the West while adhering to greater fiscal discipline: Central Europeans are used to some degree of poverty, their economies are growing, and their governments still remember difficult “transitions” in the 1990s. National debt is then typically lower in these countries than in spoiled Western Europe. If your national economics are spooking foreign investors – because your rulings are erratic or punitive – you are probably doing something wrong. Europe may be wise to finance the experiments of Orban and other nationalist governments, such as the one in Poland, just to see how their results hold up next to neighboring countries’ more orthodox policies. As long as the nationalists don’t engage in gross macroeconomic and fiscal mismanagement — and with Orban, that hasn’t been a danger — it’s useful to watch different models implemented rather than imagined by academics. Europe, with its diverse governments, provides a unique opportunity for policy competition and comparison. Orban’s experience is relevant to Trump’s U.S., too: Some of his methods might just work there if the Republicans get up the courage to try them. The rejection of borders and national economics was widespread across Western academic, media, and political circles (e.g. Bill Cliton’s notorious September 2001 comments on “the ultimate wisdom of a borderless world”). However, it was in the European Union that these doctrines were theorized and actualized most explicitly. What all of this amounted to was an apology for and rationalization of the political impotence of contemporary Europeans in the face of the economic and political forces of globalism. The most prominent discourser in this vein was none other than one of the last living members of the Frankfurt School: Jürgen Habermas. The Frankfurt School has become famous, being attacked by nationalists for spreading Marxism and attacking traditional values in Western universities. Wikipedia claims this is a “conspiracy theory” rather than simply an observation of historical fact, as notably documented by Kevin MacDonald (see Chapter 5 of his classic The Culture of Critique). The Frankfurt School both encouraged and was a reflection of the hard leftward shift of postwar Western culture. These academics were influential. Herbert Marcuse, a member of the School, was the guru of the 1960s student movement in the United States. Habermas, for his part, is practically the official intellectual of the European Union and the Federal Republic of Germany, with more awards than a Brezhnev-era apparatchik. Anyway, all this is beginning to fade into the background. The state is still here. The nation is still here. The idea of republic is still here. 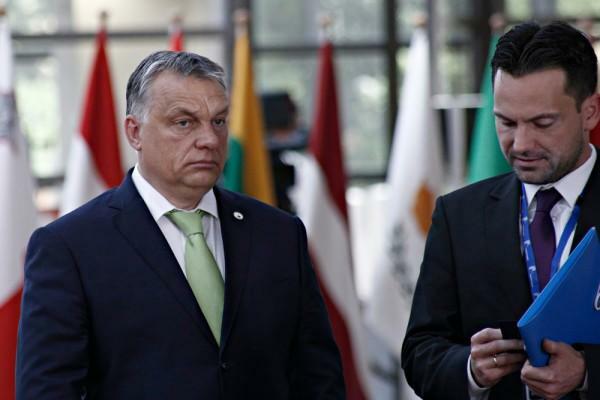 Orbán represents a return to the reality principle, towards a world based on the realities of states and nations, rather than the fashions of the Davos set.